Ships dock at Roseau Cruise Ship Berth in the center of the capital near shops, restaurants and transportation. Market stalls line the street adjacent to the pier. Taxis, minibuses, and tour operators are available at the berths. 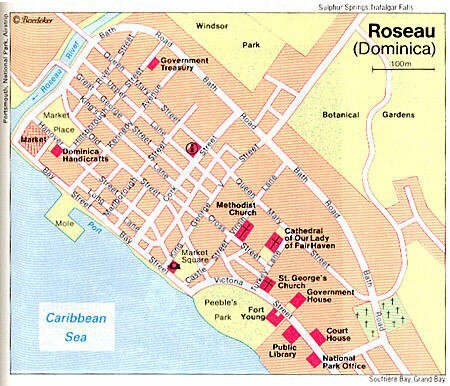 Roseau is laid out in an easy to navigate grid system with many of the tourist facilities clustered around the cruise ship dock; the tourist office and Old Market are close by. Roseau is a colorful West Indian capital, its streets lined with old stone-and-wood buildings. Reggae music is sounding everywhere during the day. Within walking distance is the Dominican Botanical Gardens where you can catch a glimpse of the rare Sisserou parrot. Morne Trois Pitons National Park. The National Park is named after its highest mountain, Morne Trois Pitons, meaning mountain of three peaks. The park is a significant area of volcanic activity. Features within the part include the Valley of Desolation, a region of boiling mud ponds and small geysers; the Boiling Lake, Titou Gorge, and Emerald Pool. It is easy to get around Dominica. Taxi service is readily available, as are small buses or vans that travel the highways, picking up and dropping off passengers on request. Official taxi fares are posted; keep in mind that figures are listed in Eastern Caribbean dollars. Taxis are about $30 an hour. Be very specific about the itinerary and what's included etc. Make sure they are certified. Within easy walking distance of the cruise pier there are numerous shops and markets selling a wide variety of local goods like rum, baskets, batiks, wood carvings, scented soaps and postcards. For a taste of the real Dominica, explore the old market (once a slave-trading market), a colorful riot of fruit, vegetable and flower stalls.